Still looking for a class? Check out these highlighted courses for Fall 2019! AFRI-A 100, "Intro to African Studies"
Interdisciplinary introduction to African Studies, with topics focusing on history, geography, life-ways, music, religion, philosophy, literature, and the visual arts. Critically examines the framing of Africa in the Global North and modes of knowledge production about Africa. Provides the foundation for further coursework in African Studies. CEUS-R 294, "Intro to Hungary, Estonia, and Finland"
Introduction to Hungary, Estonia, and Finland, three European nations whose peoples speak unique Uralic languages. Covers their culture and history as shaped by their Uralic heritage and by Germanic, Turkish, and Slavic conquerors. Focuses on national awakenings, independence, communism, and their role in Europe today. CEUS-R 329, "Gender and Women in C Asia"
CEUS-R 392, "Uralic People and Culture"
CEUS-R 414, "Yasavi Sufis & Central Asian Islam"
Surveys the Yasavi Sufi tradition, famous for the magnificent shrine complex built by Timur and the collection of Turkic mystical poetry ascribed to Ahmad Yasavi. There is much more to the Yasavi tradition, however, and it is an unparalleled window on the religious history of Islamic Central Asia. EALC-E 100, "East Asia: An Introduction"
What is "East Asia"? Are China, Japan, Korea more alike than different? Should Vietnam be seen as part of East Asia? Is "East" Asia somehow different from other parts of "Asia" (South, Southeast, Central), and if so, how? These are just some of the questions this course will answer. We begin this course by introducing the idea that Vietnam is part of "East Asia" and then work our way across the histories of all four states and culture areas to discover what they have in common, how each is different and unique, and how this region continues to be important in global affairs today. We will touch on politics, writing, art, religion, economics, environment, war, and foreign relations in a broad sweep of time from ancient to today, to better understand "East Asia" in this course. EALC-E 203, "Issues in East Asian Cultural History"
Violence and Culture in Pre-modern Japan Most people associate the Japanese samurai with fierce killing machines, who in lieu of suitable targets would not hesitate to kill themselves in gruesome ways. During this course, we will take a closer and critical look at how violence shaped the culture of medieval Japan - and how culture shaped the use and perception of violence in society, politics, religion, and literature. We will engage general theories on violence and discuss the cultural ramifications of violence with comparisons to other East Asian societies and to present day issues and debates. At the same time, the course is also an introduction to the rise of the warriors in Japanese history Â¿ not only as a military and political force but also as carriers and developers of a refined cultural legacy. EURO-W 406, "Food Cultures of Greece"
In this course, students are invited to explore Greek culture through its food. We will begin, historically, by exploring the dietary choices of inhabitants of the region that is today Greece during Classical antiquity and the Roman/Byzantine Empire. We will then examine how the discovery of the Americas and the Turkish conquest of Byzantium influenced the Mediterranean diet. Finally, we will investigate how more recent events—the population exchanges of 1923 between Greece and Turkey that followed Greece’s Asia Minor campaign, the Nazi occupation of Greece during World War II, and globalization and neoliberalism—have altered Greece’s food culture. EURO-W 406, "Russian and Soviet Film"
Development of Russian cinematography from 1896 to the present. Characteristic features of Soviet films; the theory and practice of filmmaking in the former Soviet Union; the Soviet and Russian cinema in its relationship to Russian literature and in the larger context of European cinema art. Knowledge of Russian not required. Basic sound patterns and writing system with ideas about grammar. Ideas about simple sentence structure and basic grammar leading to reading and construction of short sentences. Learning essential vocabulary for everyday conversation. Practicing different expressions: apology, greeting, etc. Classroom use of films, tapes, short conversation, stories, etc. Introduction to the Hindi language, the writing system, and basic grammar. Graded exercises and readings leading to mastery of grammatical structures and essential vocabulary. Development of reading and writing competence and simple conversations based on personal information, courtesy expressions, greetings in contemporary Hindi. Classroom use of stories, tapes, films, and songs. Introduction to Sanskrit, a classical language of ancient India. Students master the script and begin to learn grammar as they read simple material and gain vocabulary. Introduction to the Urdu language and basic grammar. Graded exercises and readings leading to mastery of grammatical structures and essential vocabulary. Simple conversations based on personal information, courtesy expressions, and greetings in contemporary Urdu. Classroom use of stories, tapes, films, and songs. INTL-I 300, "Russian Foreign Relations & Eastern Europe"
Why did Russia annex Crimea in March 2014? Why does Moscow continue to support pro-Russian separatists in eastern Ukraine? What can the Ukrainian crisis tell us about Russia’s relationship with Eastern Europe more broadly? This course will examine Russian foreign relations in Eastern Europe since the Second World War, exploring topics such as the rise and fall of the Soviet bloc, economic interdependence, and the security challenges of the post-Cold War order. Lectures, readings, and discussions will also consider how Russian relations with other parts of the world, particularly the West, affected Moscow’s behavior in the region during the Cold War and after. INTL-L 354, "Immigration, Law, International Policy, and Migration"
This course will focus on immigration law from, respectively, a legal, political, international, public policy, social, and ultimately, moral and ethical perspective. We will address issues such as citizenship, migration, marriage, asylum, and many more areas that relate to immigration law. To begin, in light of the current debate on immigration, we will explore how this discussion relates to issues such as class, inequalities, employment opportunities, and the history of who has been able to migrate to the U.S. and during what time periods – and who has not. We also will study the implications of the rhetoric that has been used by the various sides during the course of this debate and, in particular, how civil society has responded. Additionally, we will analyze how international law, international treaties, and international institutions have contributed to both the public discourse and to public policy as it relates to immigration. And thereafter, we will look at the empirical research and data on what is actually occurring in terms of immigration trends within and into the U.S. At the end of the semester, my hope is that we will each have a more detailed understanding of the complex nature surrounding immigration policy in the United States. 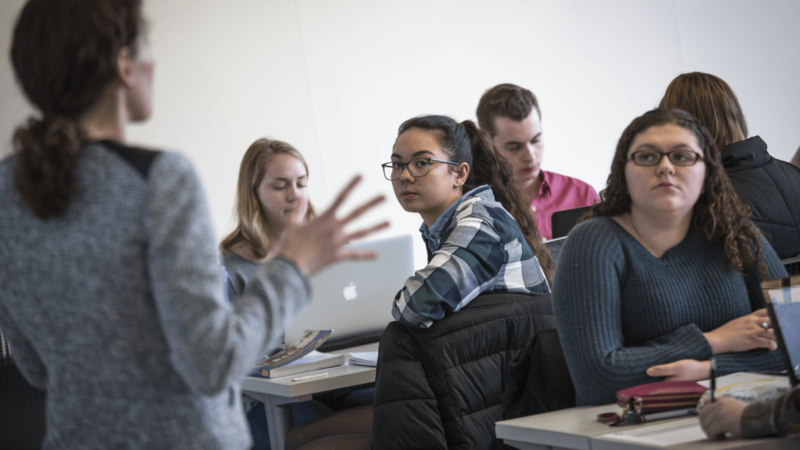 INTL-I 340, "Ethics and Decision-making in International Politics"
This course explores the role of ethics and moral considerations in how and why states and politicians act internationally. Although some portray international politics as a realm of clashing national interest bereft of moral consideration, at the level of the individual, political leaders from antiquity to the present have sought to justify their actions in moral terms. This class explores normative reasoning – what should I do? – in all its aspects as applied to questions of international politics, including: whether to go to war and how to fight; what if any obligations the developed world owes to the developing world; whether and how to promote human rights and democratic government; moral justifications for authoritarian government; and national borders and who can cross them. Readings range from classics including Thucydides, Machiavelli, and Kant to modern works by Michael Walzer and Kwame Anthony Appiah. INTL-I 300, "War, Genocide, and Literature"
This course is focused on artistic expressions that deal with the darkest moments of the last century. Experiences so painful that the individuals who endured them often would like to forget carry within them the moral imperative that they need to be remembered. How should war and genocide be portrayed and remembered? What is the proper way to hand down the collective memory of trauma to future generations? Some of these events still have living witnesses, some do not and this makes the case for the role and responsibility of a cultural memory that much more important. The course takes on one of the most important issues when it comes to remembering and forgetting and attempts to explore it in a multi-dimensional approach. INTL-I 305, "Media and the Middle East"
This course will explore media representations of Middle Eastern societies, as well as the role of media in Middle Eastern countries with an emphasis on Iran, Turkey, Egypt, and the Levant. Beginning with foundational media theory, we will then consider the history of mass media in the region, including print, radio, and television. The course will go on to treat the roles of old, new and social media in political and cultural revolutions of recent decades, along with the complexities of globalized media production involving transnational collaboration and diaspora populations. LTAM-C 101, "Elementary Haitian Creole"
Introduction to Haitian Creole, the vernacular language of Haiti spoken by over nine million people; conversational drills, grammatical explanations, and exercises; listening comprehension training; aspects of Haitian culture. Introduction to Yucatec Maya language and culture. Yucatec Maya is an indigenous language of Mexico spoken by close to one million people; basic grammatical structure and vocabulary; conversational drills; and lessons on historical and cultural context. NELC-N 208, "Muslims in the West"
How did Muslims define the West and why? How did the West interpret Islam and Muslims during the course of their historical relationship? What were and are the outcomes of those interpretations? What should we anticipate next? Given that Islam and Muslims were in the heart of various discussions; this course will focus on Islam and its intellectual history where it encounters the "other." It will also concentrate on the contemporary relationship between Islam and the West while exploring the historical roots of the encounter. We will examine the intellectual history, socio-political movements, as well as analyzing the interaction between Islam and the West in terms of Orientalism, Occidentalism, Islamophobia, Reformism and so on to study their impact on this relationship. NELC-N 303, "Issues in Middle Eastern History"
In-depth study of a particular topic, problem, or theme of Middle Eastern history. Topics will vary. NELC-N 233, "Golden Age Islamic Civil"
Focuses on the Abbasid period of Islamic history, which started in 750 of the Common Era, and is considered the "golden age" of Islamic civilization due to remarkable accomplishments in culture, art, architecture, and scholarship during this time. NELC-N 304, "Issues Middle Eastern Culture & Society"
In-depth studies of particular problems, themes, and topics relating to the cultures of the Middle East. Topics will vary. NELC-N 216, "Israeli Inequality in Context"
How does Israeli inequality compare to inequality in other societies? And within Israel, how do different axes of inequality, like nation, gender, sexual orientation, immigration status, etc., relate to and inform each other? The course addresses these questions using a social stratification approach. REEI-R 300, "Russian Foreign Relations and Eastern Europe"
Why did Russia annex Crimea in March 2014? Why does Moscow continue to support pro-Russian separatists in eastern Ukraine? What can the Ukrainian crisis tell us about Russia's relationship with Eastern Europe more broadly? This course will examine Russian foreign relations in Eastern Europe since the Second World War, exploring topics such as the rise and fall of the Soviet bloc, economic interdependence, and the security challenges of the post-Cold War order. Lectures, readings, and discussions will also consider how Russian relations with other parts of the world, particularly the West, affected Moscow's behavior in the region during the Cold War and after. REEI-R 300, "Russia and its Neighbors"
SEAS-S 240, "Introduction to Southeast Asia"
Introduction to the people, societies, cultures, and institutions of Southeast Asia and to their regional forms of association, with a focus on contemporary Southeast Asia. SGIS-S 201, "Data Visualization for Global and International Studies"
Explores how data are presented in pictorial or graphical formats. Provides students with fundamental knowledge and skills to identify useful data sources, formulate relevant questions, analyze, interpret, and communicate trends in quantitative and qualitative data. Students will learn how to create infographics and dashboards, both of which are commonly used visualization strategies. CEUS-R 399, "Contemporary East Central Europe"
This history of East Central Europe in the 20th century is a tumultuous history of wars, hatred, heroism, depredation, robbery, civilizational decline, mass murder, ideologies of salvation, totalitarian dictatorships and democratic experiments, foreign occupations, sieges, development and decline, success and failure. This course will discuss the place of East Central Europe in international politics, the bitter legacy of the 20th century that left its shadow indelibly on the region. We shall also discuss how this legacy affected the post-1989 transitions into pluralism and democracy. CEUS-R 399/599, EURO-W 405/605, REEI-R 300/500, "History of International Politics from Napoleon to Hitler"
In 1814-1815 Europe was the center of world politics. Having defeated Napoleon, the great powers erected an equilibrium they hoped would uphold lasting stability and peace. A century later Europe was fighting the hitherto most destructive war in history, one that was only the prelude to a conflict which would kill no fewer than 50 million Europeans. This course will survey the history of international relations from the optimistic Congress of Vienna to through the Second World War. REEI-R 300, "Russia Queer Politics and Gender Outlaws"
Living inside the mental and spiritual prison for decades during the Empire and Soviet times, Russian LGBTIQ+ individuals all of a sudden had caught up with Perestroika and liberalization. That "honeymoon" would not last long and Russian LGBTIQ+ would be forced to hide themselves once again in the closet, or flee the country, being afraid of persecution, torture, and permanent humiliation. This course focuses on exploring the ”other”, “non-western” approach to defining queer politics and de-constructing gender order. We will examine the historical and political paths taken by Russian LGBTIQ individuals in their search for identity, attempts to seize the political momentum to claim the public space, and struggle to survive after democratic illusions had vanished in the hallways of the State authoritarian machine. REEI-R 300, "Contemporary East Central Europe"